When I used to go to school in Colombia, one of the things I loved to buy for lunch was a pastel de pollo (chicken turnover) and a Premio soda. I was the happiest girl eating my little turnover with my soda, and if I had any money leftover, I would buy an hojuela in the afternoon before going home. The things you remember when you think about food. During my most recent trip to Colombia I had planned to buy several of these chicken turnovers to satisfy my craving. The only ones I saw were at a cafeteria located on Avenida Oriental and you have no idea how much I regretted buying them because they were extremely DRY and bland. It was a huge downer. There’s definitely nothing better than the food you make at home. 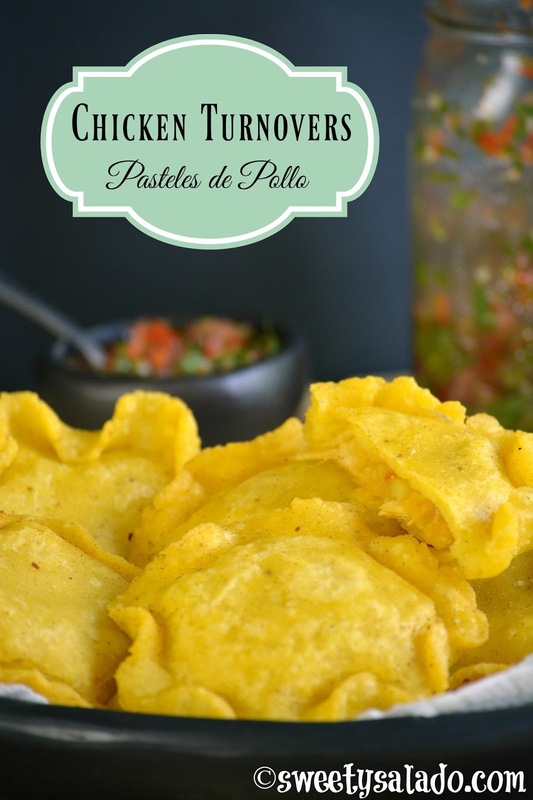 A pastel de pollo is simply a Colombian chicken empanada but with a round shape. Nothing more, nothing less. The pasteles tend to be bigger but I make them small so I don’t have any issues trying to seal them shut because otherwise, they crack. And if you want, you can fill them with this recipe’s filling or with the fillings I used for the chicken empanadas and beef empanadas that I already have on the blog. Place the chicken breast, green onions, white onion and garlic in a medium pot and fill with enough water to cover the chicken. Cover the pot and bring it to a boil on high heat. Once it's boiling, reduce the heat to medium low and cook for 30-35 minutes or until the chicken is cooked through. Remove the chicken from the pot and let it cool. Shred it and set it aside. Place the potatoes in a medium pot, cover with water, and season with salt. Cover the pot and bring it to a boil on high heat. Once it's boiling, reduce the heat to medium low and cook for 20-25 minutes or until the potatoes are tender. Drain them and mash them with a potato masher or a fork and set them aside. To make the masa (dough), pour hot water into a large bowl. Add the chicken bouillon, food coloring, vegetable oil and salt. Stir well and then slowly add the pre-cooked cornmeal. Knead with your hands until it's soft and smooth. Cover with plastic wrap or a clean kitchen towel and let it rest for 10 minutes. Heat the olive oil in a large pan on medium heat. Add the green onion and garlic and cook for 2 minutes. Add the chopped tomatoes and cook for 7-8 minutes or until they're softened. Season with cumin and food coloring. Add 1 cup of water and then season with salt and pepper to taste. Now add the shredded chicken and the mashed potatoes and stir well to cover them with the tomato sauce. Taste for seasoning and add more salt, if needed. Pre-heat oil at 350ºF (180ºC). To assemble the turnovers, make small balls of masa of about 1 inch (2,54 cm) in diameter. You will need 2 small balls per turnover. Cover a tortilla press with plastic, place a small ball in the center and press to make a disc, put it aside and do the same with the second small ball. Fill one of the discs with about 1-2 tbsp of filling leaving a border of about ½ inch (1,27 cm). Place the second disc on top of the filling. Press the borders with your fingers to seal it and then crimp the edge with your thumb. Continue this process until you are done assembling all the turnovers. Deep fry the turnovers in the pre-heated oil for about 7-8 minutes or until they are golden brown. Make sure to flip them over halfway through the cooking process so they cook on both sides. Drain them on paper towels and serve them immediately with either Colombian hot sauce, Colombian green hot sauce or guacamole. 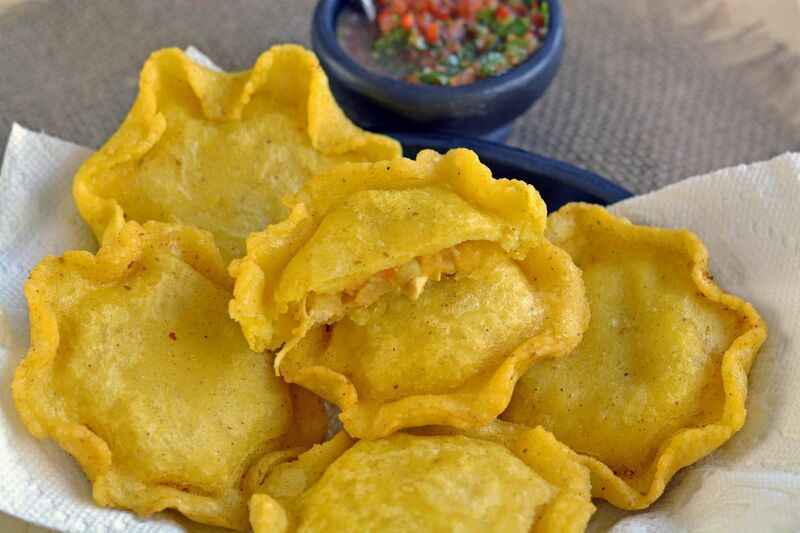 To avoid getting cracks in your pasteles, deep fry them as soon as you assemble them so the dough doesn't dry out. Also, to make them really crunchy the dough needs to be flattened really thin and they will have to be deep fried for much longer, while trying not to get them burnt.